Das Bild zeigt Erin mit einem E ;-) beim Tacheles in Berlin. 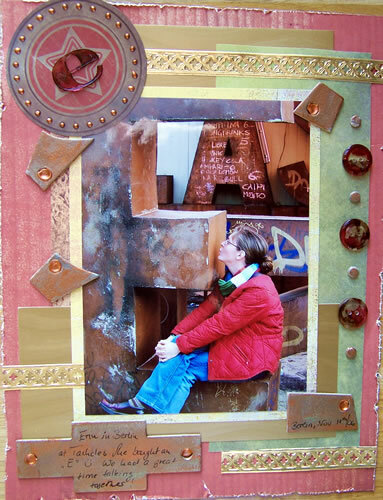 Ich habe hier bei den Chipboard Elementen die im Layout Spoon Nose angewandte Patina Technik noch ein wenig verfeinert und Metallic Acryl Paint drÃƒÆ’Ã‚Â¼ber gewischt – es gibt dem ganzen einen rostigen Look, der die Buchstaben im Foto aufgreifen soll. The picture in this layout shows Erin with an E ;-) at Tacheles in Berlin. I refined the Patina Technique I used with my Spoon Nose Layout and wiped metallic acrylic Paint over the chipboards for a rosty finish. Just as in the letters in the photos. Journaling: Erin in Berlin at Tacheles. She bought an “E” :-) We had a great time talking together! Berlin, Nov. 18th,06. This is great,love all the embellishments! Great job! Congratz at beeing published! Super Layout. Ich mag den Look! ich stehe auf metallic!! erin wird sich ÃƒÆ’Ã‚Â¼ber das layout freuen!! Looks cool to me schatzie! The “metal” look of this page is just beautiful! Must go to Berlin to buy myself a big D.
Was fÃƒÆ’Ã‚Â¼r ein geniales LO mal wieder!!! Stark!! !